With the help of Holition's virtual reality shopping experience, you can now try on roque® jewellery online before you buy! All you'll need is a web-camera, a computer screen, and a printed ring symbol. 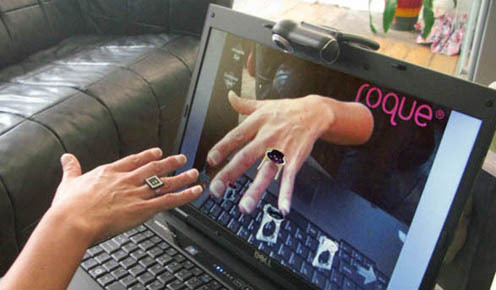 As you show the ring symbol to the webcam, it will be replaced on screen with a piece from the roque® collection. 1.) Download the Roque/Holition Viewer and install the program. 2.) Print out the ring symbol, cut out the ring, and wrap it around your finger. 3.) Angle your webcam downwards towards your hands. 4.) Run the program while wearing the symbol, and show your symbol to the webcam.